Helostoma temminckii common name kissing gouramie. They can grow up to 25-30 cm / 10-12 inches fully grown. 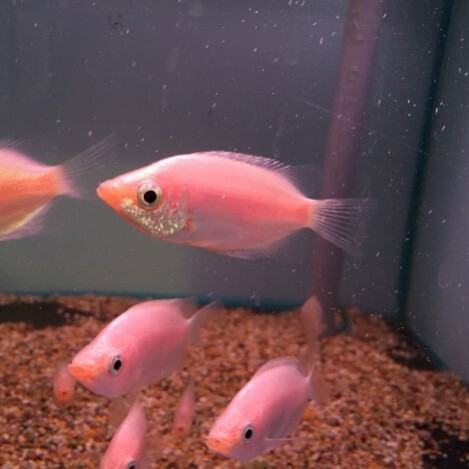 They are best kept in water parameters of PH range 6.5-7.5, and temperatures of 22-25 Celsius / 72-77 °F. Kissing gouramie can be very peaceful when small, but as they get bigger they can swallow smaller fish that can fit in there mouths. So mixing them with bigger community fish is best. They are named kissing gouramie as there unique behaviour of appearing to kiss each other, but in reality this is actually there way of exerting their territorial rights. There are green and pink variations of the kissing gouramie. 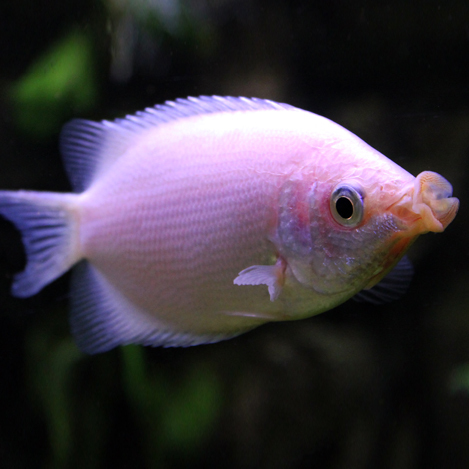 They enjoy a diet of flak, pellets, and granular foods. They also like plants and some times algae based foods are a good part of there diet to. With also treats of freeze dried, frozen or live foods.